Bullsnakes are non-venomous snakes with a large, heavy body, with a yellowish tan from head to tail. 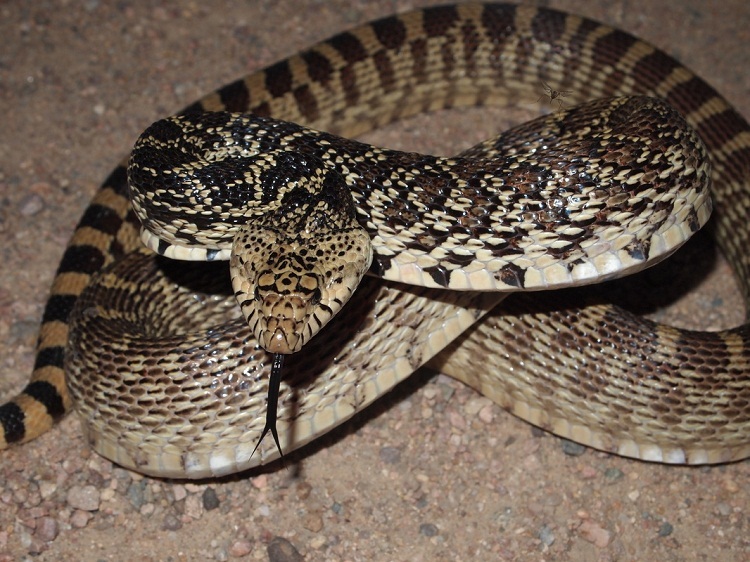 They are native to the arid regions sharing its habitat with the rattlesnakes. They are powerful snakes which constricts it prey and swallows them. Size: Bullsnake is considered one of the largest snakes in the United States. It grows up to 6 feet (1.8 m) in length. Records prove that there have been specimens of this species growing up to a length of 100 inches (2.5 m). Appearance: The head and neck of the bullsnake is more or less of the same width. 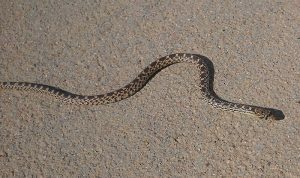 It has a prominent overhanging supraocular scale above each eye makes the bullsnake look as if it is perpetually scowling. The rostral (nosetip) scale is thick and vertically elongated. Skin: Bull snakes have strong keeled scales that make the skin of the snake rougher as compared to other species. Dark vertical lines run between the upper labial scales and extend diagonally rearward from the eye to the posterior throat. Colour: Their body may vary in ground colour, mostly yellow or tan, with prominent reddish or brownish blotches running in a pattern all along its body from head to tail. Other colour variations including white and albino have also been recorded. 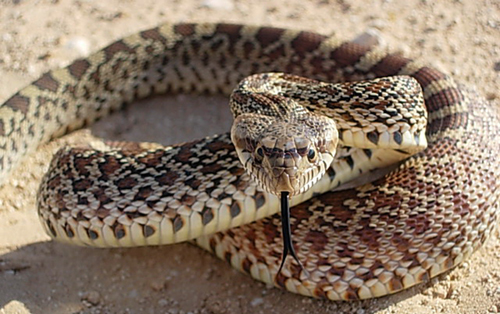 Bullsnake can be found throughout the central United States, northern Mexico and south west of Canada. 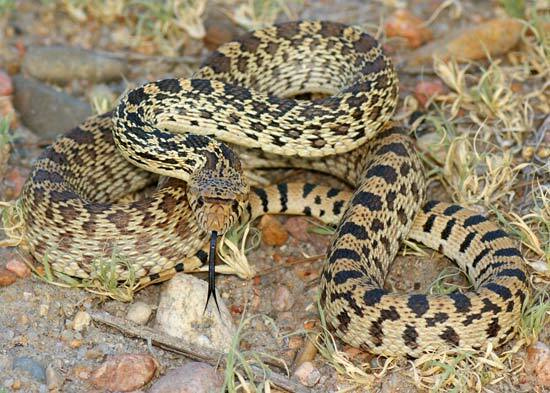 Bullsnake are found in the arid regions, coniferous forest, open woodland, farmlands and the grasslands. They occupy the burrows of the other rodents or built their own burrow. Bull Snakes are large powerful Constrictors known for their bad temperament, they are not aggressive by nature but if provoked are very defensive. 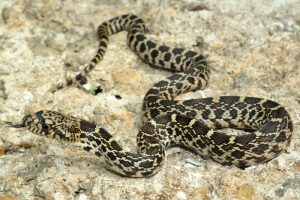 They will imitate a diamond back rattlesnake, since they have a similar appearance, by coiling and hissing loudly while making a rattling sound by beating their tail to the ground rapidly. This is purely a defensive mechanism that usually gets them mistaken for rattlesnake and at times endangers them. Otherwise once accustomed to being handled, Bull snakes make great pets. Bullsnake spawn in March. They lay their egg between April to June. The female lay dozens of eggs and leave the egg unprotected on its nest or sand to incubate. The eggs are elliptical, up to 77 mm long. They are rough, sticky and leathery. The eggs hatch by August to September. The hatchlings are greyish and are 20 to 46 cm long. 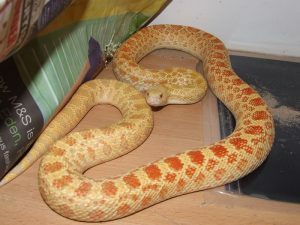 Bullsnakes live up to 12 to 16 years in the wild, however has lived for almost 30 years in captivity. Kites and hawks are its predators. 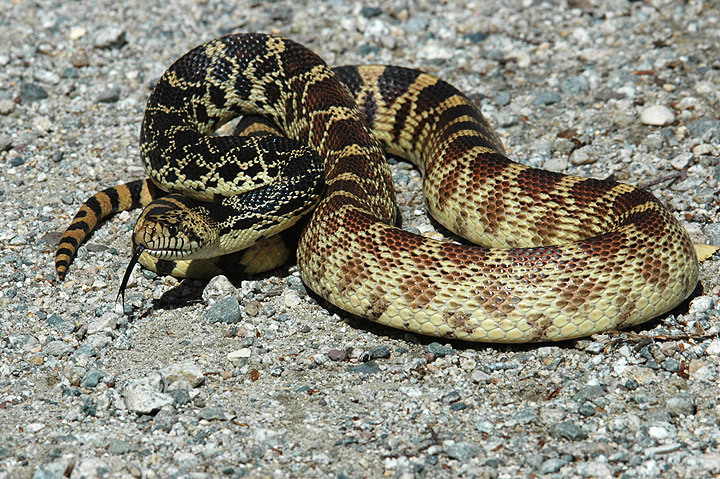 Bullsnakes are carnivorous and feed mostly on available rodents. They feed on mice, rats, small rabbits, pocket gophers and also on small ground dwelling birds. The juvenile bullsnakes on the other hand prefer lizards and other insects. Once the bullsnakes catches its prey, it coils around its body, slowing constricting the prey. Eventually the prey suffocates and dies. 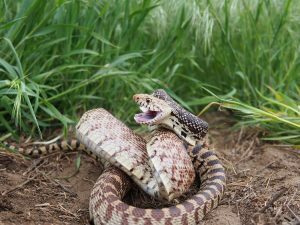 The bullsnake swallows the entire prey. 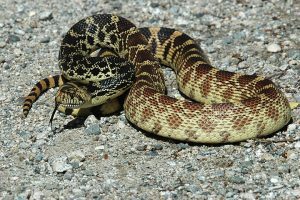 Bullsnakes can be kept as pets however they are dangerous if provoked. Hence certain handling information is necessary if they are intended to be kept as a pet. 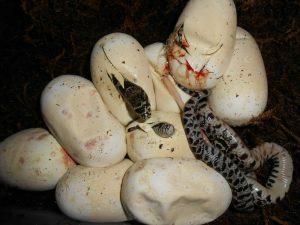 Bullsnake hatchlings are large. 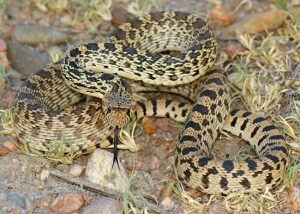 Bullsnakes, if given proper care can grow up to a length of 6 feet within two years hence proper space for the snake should be arranged. A pair of bullsnake should be provided with at least a space of 18 by 48 inches which is equal to the space occupied by a 75 gallon tank. Sizable limbs, cork bark or other commercial hides as a form of cage furniture should be provided. Also this furniture should be fixed so that they do not topple on the snakes. Ensure the top of the cage is covered so it will secure the cage. Bare bulb or ceramic heating unit should not be unprotected of malfunctioning as the Bull snakes might burn themselves when they come out to bask under a heat-providing lamp. Under cage heating is the best way to ensure complete safety to your snakes. The cage temperature should be 72 to 75 degrees Fahrenheit during night and 82 to 88 degrees Fahrenheit at night. 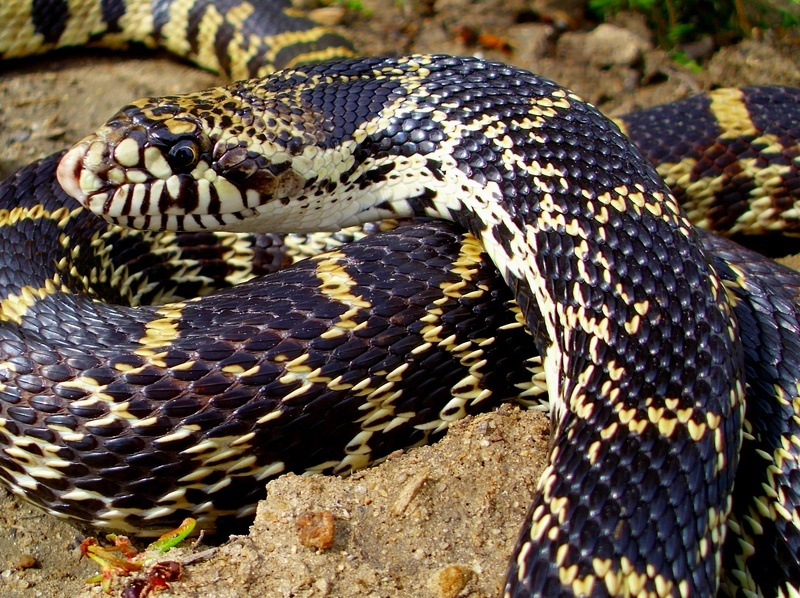 These large snakes diet in the wild mainly consists of rodents. As pets theses snakes eat mice and rats. The hatchlings can eat an entire mouse the moment they are hatched. 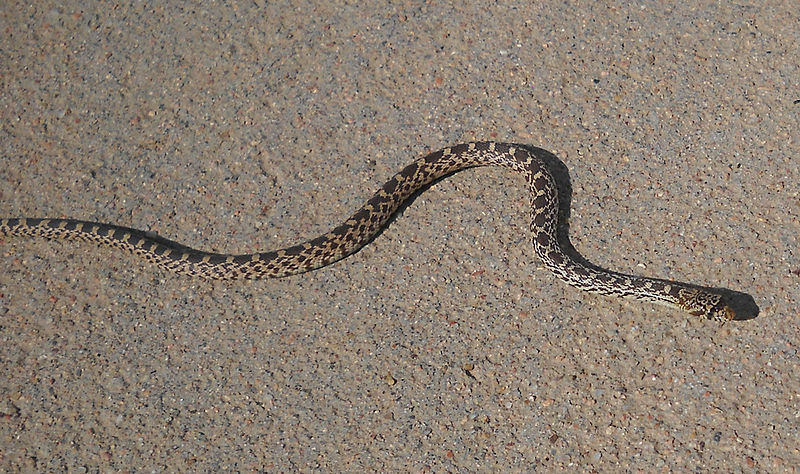 Hatchlings feed on a mouse a week and the adult bullsnake can eat several rats and mice a week. Never feed your snake a whole meal larger than its head, this is the best way to ensure your snake is injury free and also never feed a live rodent to the snake as a rodents bite may prove fatal to the snake. Hence pre killed is best for your snake. Bullsnakes respond aggressively to fast movement hence slow movement is advised. While handling the snake, slow movement from the side should be approached. The snake should be caught loosely the back of the head and half way from its tail tip. Never grasp the snake at the neck and after it has taken its meal. Avoid handling the snake for few days after it has taken its meal. Malfunctioning temperature regulators such as baffled bulb, hot rock or a ceramic heater can cause thermal burns to the snake. Mouth rot (infectious stomatitis) is a common infection if the snake’s teeth are broken or mouth lining cut and not medically taken care of in time. Unhygienic and damp cages and inconsistent temperature changes can cause causes blister and respiratory diseases to the snake. 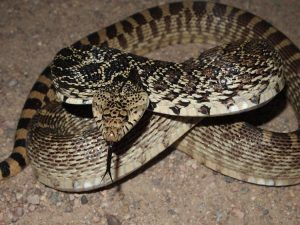 Do not feed a live rodent to the bullsnake as the rodent bite may be fatal to the snake. Make sure proper shedding is provided for the snake as improper shedding will lead to blister disease due to low humidity and hydration. Here are some of the pictures of bullsnake. I just an infant Bullsnake. I believe it was hatched in September. Moved close to me and stopped. Very beautiful snake. I’m a little scared do to the many snakes here. Rattlesnakes and other large snakes, are the reason I’m here! 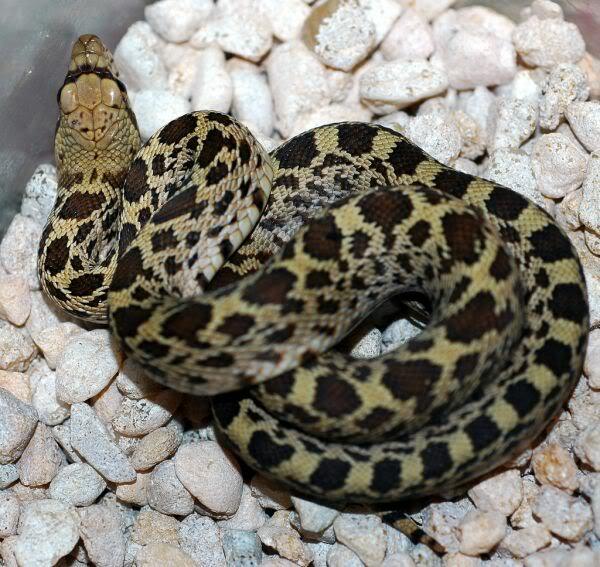 We had a bullsnake that my parent’s cat dragged in (before I was born) as a baby that just died, he was about 33 years old! I need help. My baby bullsnake just shed for the first time in 3 months and he still wont eat. I got him at christmas as a gift. He was rescued. He has scars from a cat attack and is missing 1 eye. What can i do to help him? My vet said he might need to shed again but wont he starve? I mean 1/4 if the year without food when hes supposed to eat every 10-14 days. Some place I heard that bull snakes kill rattlers is this true??? ?